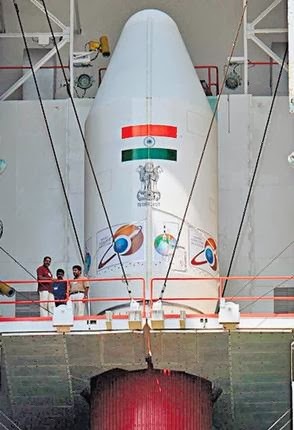 1) Countdown begins for Mars mission: India’s ambitious mission to Mars moved ahead smoothly on Sunday with the 56.5- hour countdown beginning at 6.08 a.m. at the Sriharikota spaceport. If the countdown progresses without any “hold,” the four-stage Polar Satellite Launch Vehicle (PSLV-C25) will lift off from the first launch pad at 2.38 p.m. on Tuesday (November 5) and put the 1,350-kg Mars Orbiter in a long, elliptical earth-orbit. 2) Nitaqat: grace period ends- Saudi Arabian government will impose the Nitaqat law from Monday, sending fears among large sections of expatriates from Kerala. The law, meant to put an end to illegal immigrants, is being imposed after having given a grace period of seven months for expatriates to leave that country. 3) Pakistani folk singer Reshma died: Legendary Pakistani folk singer Reshma, 66, who mesmerised music lovers with soulful rendition of songs like Lambi Judai and Dama Dam Mast Kalandar in her trademark rustic voice, died in Lahore on Sunday after a prolonged battle with throat cancer. 4) Sensex touches record high on Muhurat trading: In a special session of Muhurat trading on Sunday stock market indices surged ahead as the benchmark Bombay Stock Exchange (BSE) 30-share Sensitive Index (Sensex) ended up at its second consecutive record high of 21,239.36 with a gain of 42.55 points or 0.20 per cent. 5) Nitish Sengupta passes away: Former Lok Sabha MP and Revenue Secretary Nitish Sengupta passed away after a massive cardiac arrest on Sunday. 6) Vettel makes it seven on the trot: Sebastian Vettel eased to victory in the Abu Dhabi Grand Prix on Sunday for his seventh successive victory and 11th of the season. The 26-year-old German led home a Red Bull 1-2 for the 15th time in Formula One, giving the team its100th podium finish, as Australian Mark Webber’s second-place finish saw him crossing 1,000 points in his Formula One career, which comes to an end at the end of the season. German Nico Rosberg was third for Mercedes. 7) Kohli is No. 1 ranked ODI batsman: Virat Kohli on Sunday became the No. 1 batsman in One-day cricket after a superb batting show against Australia in the just-concluded series, in which he scored 344 runs. Kohli has now become the third India batsman to hold the No. 1 batting rank in ODI cricket, after Sachin Tendulkar and M.S. Dhoni. Tendulkar first claimed the No. 1 position when he took over from Brian Lara in February 1996. He was last No. 1 in March 2008. 8) Indian men qualify for 2014 Hockey World Cup: Indian men officially confirmed their presence at the 2014 hockey World Cup following Australia’s success in the Oceania Cup on Sunday.The 2014 World Cup will be held from May 31 to June 15 at The Hague, the Netherlands. Eleven out of 12 men’s teams have been confirmed while the final spot will go to the winner of the Africa Cup of Nations. 9) Kanpur to host third ODI: BCCI on Saturday officially allotted the third ODI between India and West Indies, scheduled on November 27, to Kanpur. 10) World Number Two Serbia's Novak Djokovic has lifted the Paris Masters Tennis tournament. In the title clash at at the Bercy arena last night, Djokovic defeated defending champion David Ferrer of Spain in straight sets, 7-5, 7-5. 11) Festival of Lights, Diwali celebrated across the nation. The festival marks the triumph of good over evil, of righteousness over treachery, of truth over falsehood, and of light over darkness.